This was my 44th theater show, and my 4th time seeing this stage. I arrived early to grab lunch in Akihabara, and then sat down for coffee across the street at Excelssior Cafe, making it into the theater around 6 minutes before cutoff. I received ticket #165. Middle of my group. We’ll see how lucky this number is. I didn’t bring a backpack to Akiba, so I had to put everything I was carrying into the tray for the metal detector. I put everything in a plastic bag so I wouldn’t waste any time removing my stuff from the tray. The VIPs, women, and enpou all entered the theater. It was time for the seat lottery…. So my group gets called in 7th (well, 6.5 since 230-239 is only 3 people) I wanted to sit somewhere on the left because that is where Ranchan usually hangs out, but as I walked in Junji-san was directing people to the right side, saying it was practically empty. Sure enough, only the first row was filled, the second was empty. So I quickly grabbed the exact same seat I had at the last show, the end seat in the 2nd row, right next to the little side stage. It’s funny though how most people try to get the inside seats in this row, not realizing that the further inside you are the more the pillar blocks your view. Also, this odd fan was sitting in the back row congratulating people who passed him. Not sure what that was about. Eventually it was showtime, Inagaki did the Kage-ana, and the curtain opened. I’m not sure, but this may have been Taya Misaki’s first ever public performance of this song. Between this stage, an the original K5 Stage which I saw like 8-9 times, I have seen quite a few different members perform it. For the first time out, I thought Tacchan did quite well. She projected nicely, and for the most part stayed on-key, although she did have a bit of trouble when she had to hold a note, her voice would wobble a bit and go flat. Also, she didn’t over-emote, which I though was a good choice given her lack of experience with the song. It seemed as if she mainly focused on singing it well. Ultimately, with a bit of practice I think she could easily iron out the kinks and be a capable second-stringer for Moeka. Kobayashi Ran: Since I was on the right side, I figured I wouldn’t see much of Ranchan util the second half of the show. To my surprise she was on my side of the stage quite a bit throughout the show. The first time she came over she didn’t notice me, but the second time she locked on to me and gave me a thumbs-up and a big smile. I didn’t react quickly enough, so she did it again. This time I gave her a thumbs-up. From the point forward any time she was right in front of me she locked on to me until she had to dance away. Also, in one of the late MCs the members were talking about their Janken units, and Ranchan was the only one on stage at the time who hadn’t yet submitted a Janken entry. Everyone was worried about her, so I am glad to read that she now has a 2-member unit with Shimoguchi Hinana. Honda Sora: There is just something about this girl, she looks like she would fit perfect in the original SDN48. I’m trying to figure out who in that group she reminds me of, but quite a few members come to mind. She is definitely the most “mature” of the draftees. She is definitely one to watch. 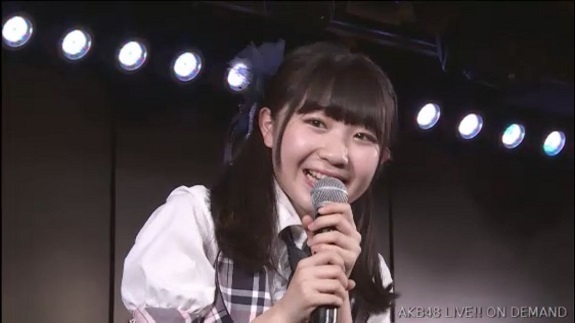 Sato Shiori: Ya know, the last time I saw this stage she wasn’t in the cast, and I really missed seeing her. I find myself quite often focusing on her during MCs, since her reactions to the other members are often very funny. She is definitely from the “Tani” school of idols, which I usually like. Plus, she just relished her role in Tsundere. She is the next draftee I want to try and meet. I think she would be a fun handshake experience. Tada Kyoka: Another group comedienne. Like Yasuda Kana, Kyoka is always looking for audience members to flirt/fish/interact with. I fact, at one point she was right above me on the side stage, and I was watching the way she expresses her self with her eyes. There were three members I wanted to be sure and interact with, so I scouted where they were beforehand. 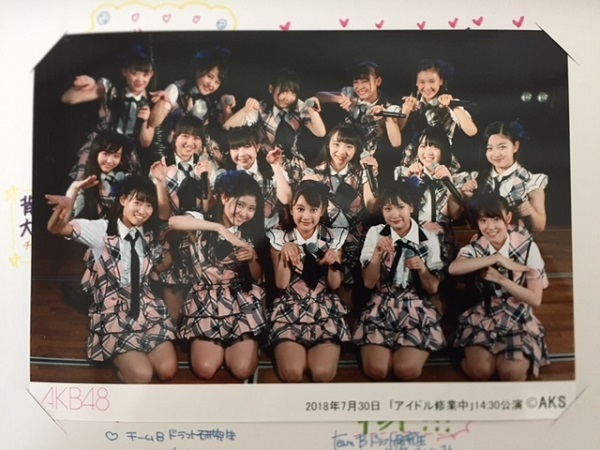 Hitomin was in the middle, and Inagaki and Ranchan were at the far end, almost next to each other. Hmmm. As I made it down the line I finally got the reaction from Hitomin I was looking for. I also got big reactions from Kyoka and Tacchan. When I got to Kaori-chan, I slowed down enough and just blurted out her Janken unit name (Orenai Kokoro) I wished I had time to tell her why I like her unit so much (she is teamed with Yukachan) but just saying the name got a good reaction. Unfortunately that interaction almost got me pushed passed Ranchan, but I slowed up enough to smile a call out her name the way I do during the show. As I looked back Kurosu Haruka was still looking at me and smiling. And with that I quickly purchased the commemorative photopack, and scurried down the escalator before the lobby got too crowded. 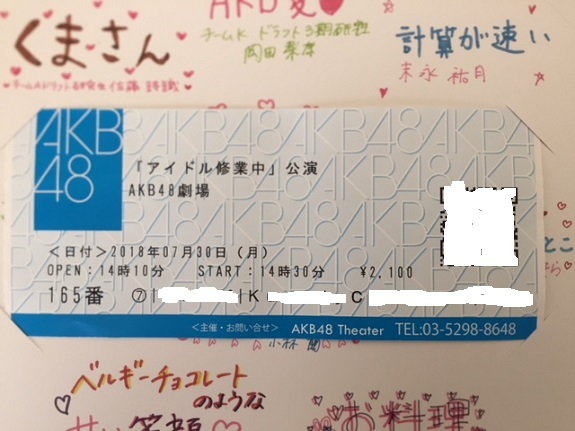 Since I don’t have any AKB handshake tickets for a while, I hope I can win more of these shows as I love interacting with the new members. I am starting to like the draftees as much as I like 16th gen. With this stage, I get a bit of both.